My goodness I've had this blog for 6 years now! Six entire years! Wow. 2018 was a pretty good and busy year for me. I went on an airplane for the first time, I went for a month long road trip across the country with my wonderful uncle (which I still need to blog about), I got a job and worked for about 5 months before being laid off (through no fault of my own). I made some new friends at work, and also spent more time with Wonderful Uncle than in any year previous. I had surgery for the first time in late November, and am quite recovered now. Me in B.C. upon seeing skunk cabbage leaves for the first time. Probably the best photo taken of me all year. I drew what is quite possibly my best dinosaur comic yet. I learned to use a thimble, which I should have done YEARS ago! Thimbles are great! I also got a copy of Costume Close Up, which is another thing I should have done years ago. It explains 18th century clothing construction so clearly. 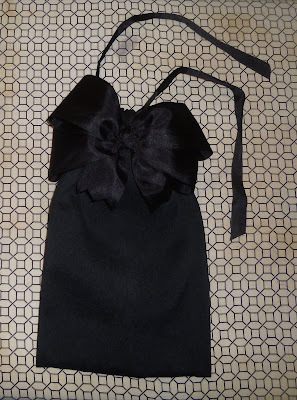 I learned so much from it, and it has noticeably improved my sewing. In other news: I recently had TWO people email me saying they want to learn about 18th century sewing, and asking for advice, which is very exciting! I'm thinking I should probably make a resources page with useful links? Maybe write some instructional posts? It's great to see more people wanting to get into sewing! I can't tell if I did about the same amount of sewing in 2018 as I did in 2017, or if I did more. There are fewer individual projects in my folder for this past year, but there are more big and time consuming ones, and I did a lot more hand sewing. I finished a few things from The Pile, and as far as I can remember I have only one item that I started in 2018 but have not finished. This was a fairly long standing unfinished thing from The Pile. 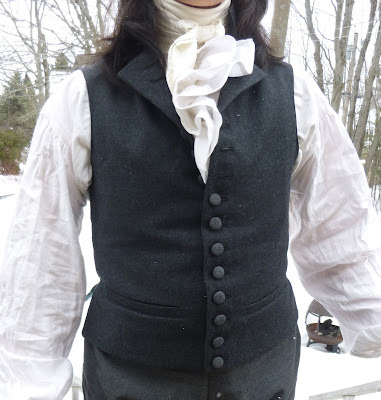 Things I sewed in 2018: 5 waistcoats, 5 shirts, 3 pairs of breeches, 2 pairs of pants, 2 linen caps, one queue bag, and one pair of gloves. 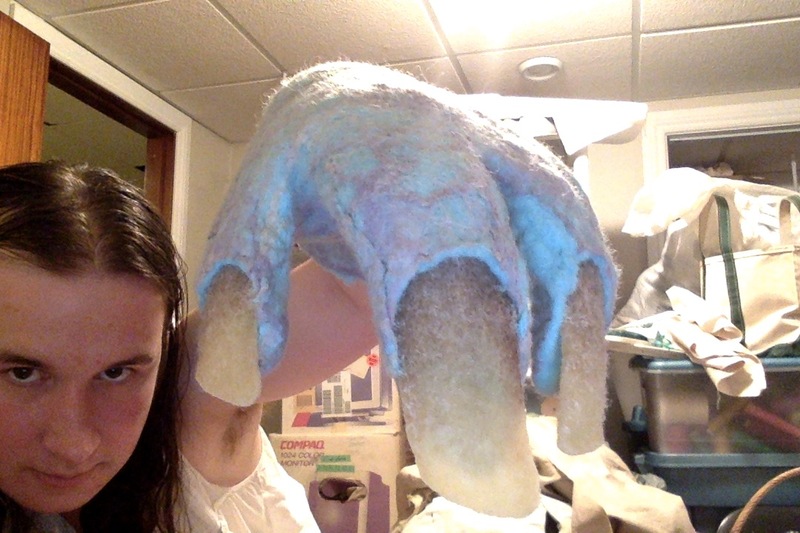 I also felted a pair of monster gloves and a cape for someone's short film, and helped with the mask that goes with them. While I was employed I did little bits and pieces of work on countless Canadian military messkit jackets, police tunics, and other such things. Edit: I forgot to add that I did a shirt commission too! A pale green linen shirt. 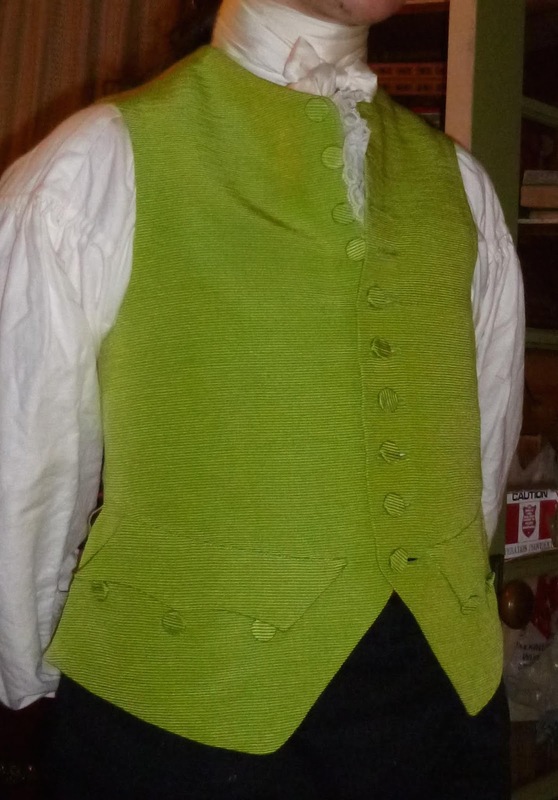 My bright green waistcoat was my first real attempt at accurate 18th century construction, and it went so well I did the next 2 waistcoats in much the same way. I was surprised by how very many compliments I got on the colour, since it's not a shade of green I'm particularly fond of. 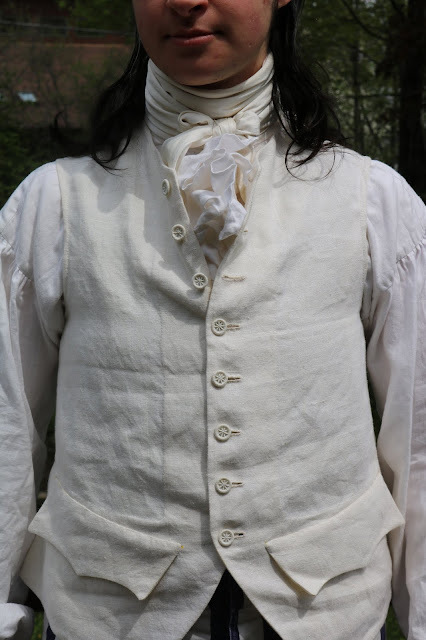 I wore my unlined linen waistcoat a lot last summer, and definitely want to make more linen waistcoats! I've worn my grey wool one quite a lot too, though it currently has the shoulder seam ripped out because I need to fix that darn wrinkle. These grey wool breeches are my favorite pair out of the 5 that I have, but like all my pairs there's something not quite right about the fit. 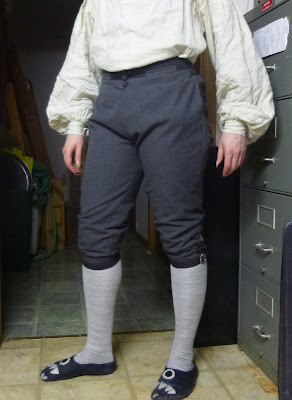 Drafting a new breeches pattern is on my to-do list for this year. 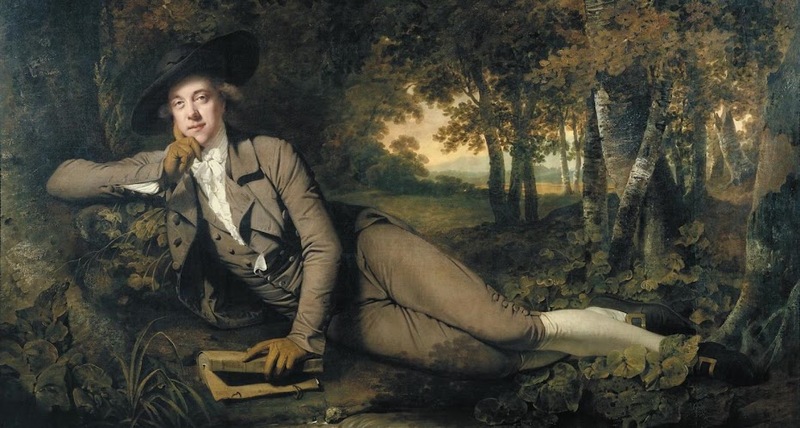 Ah, my stripey waistcoat and stripey breeches. Sadly they suffer from bad choice of fabric (cotton blend with some stretch) , and the stripes make the bad fit at the knees of the breeches very obvious. You can't see it in this photo because of the strategic angle, but I can assure you that it looks very wonky from the front. I have only worn the breeches a couple of times because the slippery ribbons are extremely difficult to tie tightly enough. Should I have added yellow topstitching to my jeeches? Probably. It would have made them funnier. My two pairs of black cotton pants are rather uninteresting, but they get worn a lot because they're easier to put on in the morning than breeches. 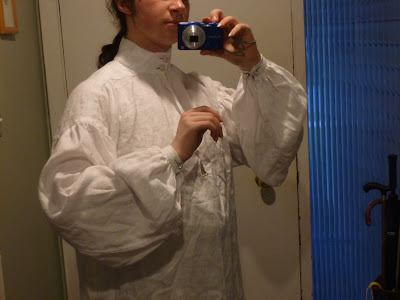 I love my early 18th century shirt! The lace is scratchy and terrible but it can easily be replaced when I find better stuff. 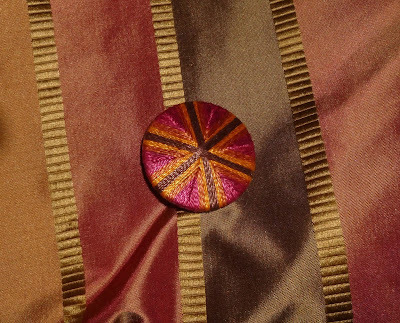 I'm also idly considering re-doing the cuffs so I can use sleeve buttons on them, and re-using the two Dorset knobs from the cuffs on the collar of another shirt. I also love my other early 18th century shirt, which is more accurate than the first one because in the time between these two shirts I learned about sleeve buttons. 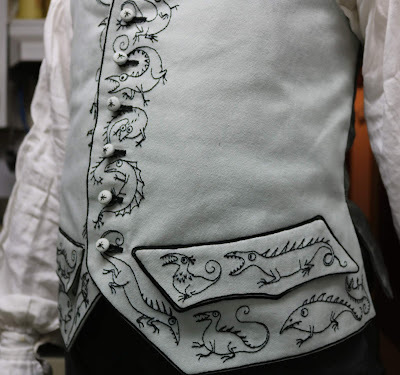 My dark grey shirt is an inaccurate colour, which makes it just right for the monster waistcoat. Speaking of the monster waistcoat, it just spent several weeks in an art gallery along with the Beardsley waistcoat! It was for a college alumni show. My green and cream shirt is... weird. I'll have to make more changes to the pattern because some things just aren't working, but I do still want to sew up some of my quilting cotton into shirts. I've worn it a fair amount because, unlike most of my other shirts, I have no problem with machine washing it. As for my shirt with the pleated ruffles, I've worn it a lot but it's full of bad choices. I have since removed the button tab and sewn the buttonhole shut. The crisp pleats all came out in the wash, as I expected, and I haven't re-pleated them once. From now on my shirt ruffles will be in a finer fabric than the shirt itself, and will be tacked on afterwards rather than permanently sandwiched in between the pieces! My round little linen cap is quite comfortable and I wear it around the house sometimes, but the one pictured above is NOT comfortable and hasn't been worn at all. I look forward to wearing this queue bag properly! While I am full of regret at the choice of materials for my stripey gloves, I'm excited to make more gloves with this pattern. 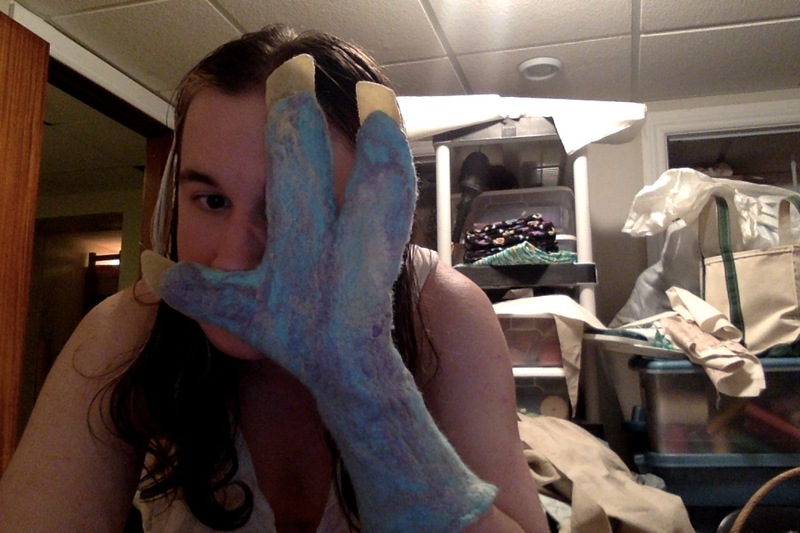 Gloves are easier and faster to sew than I expected! I'm pretty proud of the shading on these claws. Speaking of gloves, here's the prototype for the pair of monster gloves I made. The final pair is past the elbow and has pointy claws, but I don't have any photos of it, and photos of the actor in the full costume can't be posted until the short film is released. I did a few little bits of embroidery besides the monster waistcoat. 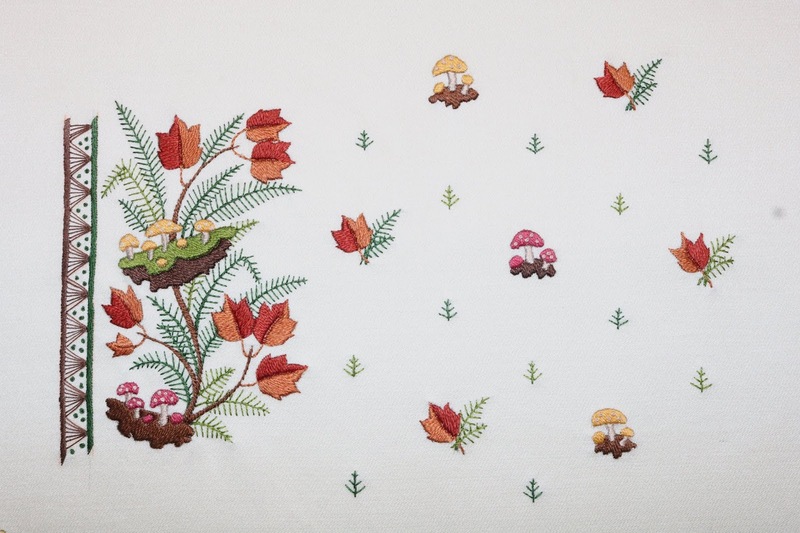 Here's a little flower I did one weekend, which reminds me how much I want to try crewel work. 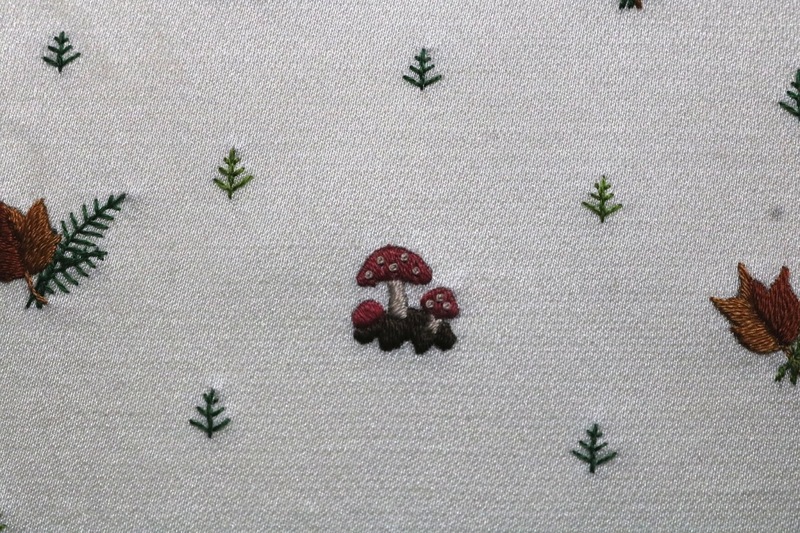 I also did this sample for a forest floor themed 1780's waistcoat which I fully intend to make. It's entirely my own design, and I think it mimics the style of embroidery quite well. This sample is on a cotton/silk blend satin, but I've bought some off white taffeta for the final waistcoat. I don't know quite what I'll do for an embroidery frame but I'm sure I can rig something up. In my last year in review post I added a list of things I'd like to do in 2018, so lets see how well I did with that. More shirts and pants. I made 2 pairs of pants and 5 shirts, so I'd say that's pretty good. 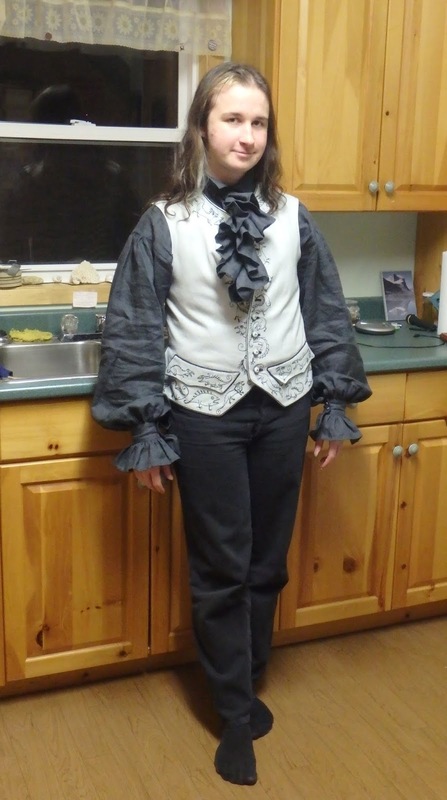 I did also wear breeches sometimes, though not as often as I'd like to. Learn how to make death's head buttons. I did do that! I made a few practice ones, including this sample one for the coat I plan to make out of this striped silk. I haven't got any finished garments with deaths head buttons but I am nearly finished a coat that will have plain black ones. More HSM submissions than 2017. I did do that! After having done only 3 of the Historical Sew Monthly challenges in 2017, I did 7 of them in 2018! More than half is not bad! More accessories! Gaiters, better cravats & stocks, and at least one or two more hats. Wow, I did absolutely none of those things. The only accessories I made this year are one pair of gloves and a queue bag. I made a couple of indoor caps but they don't really count as hats or accessories. 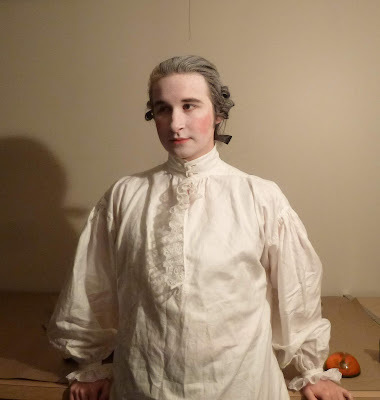 A 1730's outfit. Hmm, well I started one. I made two shirts, a queue bag, and I started a waistcoat (which I finished very early in 2019). That leaves a coat, a stock, breeches, a hat, probably some gloves, and another waistcoat in a better fabric. Finish more of my unfinished things. I've shrunk the pile but there are still quite a few things left. I finished one or two things from The Pile, but there are still more. A more encouraging fact is that I did not add significantly to The Pile in 2018. As far as I can recall I've only got one coat I started last year, which I am actively working on and which is nearly finished, and a shirt I cut out but haven't sewn. Get into the habit of keeping time sheets. I did do that! As far as I can remember I've kept time sheets on every project I started in 2018. Well, I'd say all things considered that's not bad! Especially when one takes a month long camping trip and several weeks of surgery recovery into account, because both of those things made sewing very difficult. And being employed at a tailoring shop for 5 months. After an 8 hour day of sewing there is not nearly as much motivation to come home and do more sewing. So, I will now compose a tentative list of sewing-related goals for 2019. Finish the 1730's outfit. At the very least I'd like to get the coat, stock, and breeches done. Try crewel work. Even if it's just a sample or two. 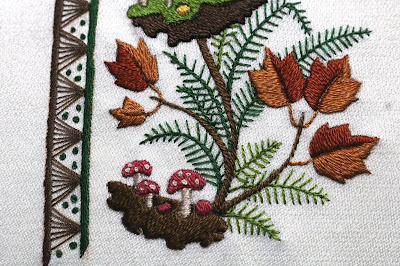 I have so much wool thread and those big colourful crewel flowers look so very nice. Finish that damn black wool coat that I started over FOUR YEARS ago. It's been hanging in my room for so long and is missing only the collar, the back portion of the lining, and buttons & holes. I started it in tailoring class and wasn't sure how to proceed without instruction, and was reluctant to do it without a working steam iron, but I got a steam iron for Christmas and can darn well figure out how to finish that coat myself! Finish some other things from The Pile too. And ponder what to do with those few projects that were started very very long ago that I will never finish and have no use for. Ponder how to re-purpose those bits. Not buy fabric. This is going to be a very difficult one, but I am determined to not buy any new fabric this year. If necessary I may possibly get a bit of lining or something to finish off a project I already have most of the materials for, but I should be able to sew plenty of things all year with what I've got. My stash is getting far too big, and I'm running out of storage space. I do. Not. Need. More. Fabric. Another Nelson undershirt would be good, and maybe a pair of flannel drawers too. Oh, and a new pair of felted slippers! Since it's the thing I did the worst on last year - more accessories. 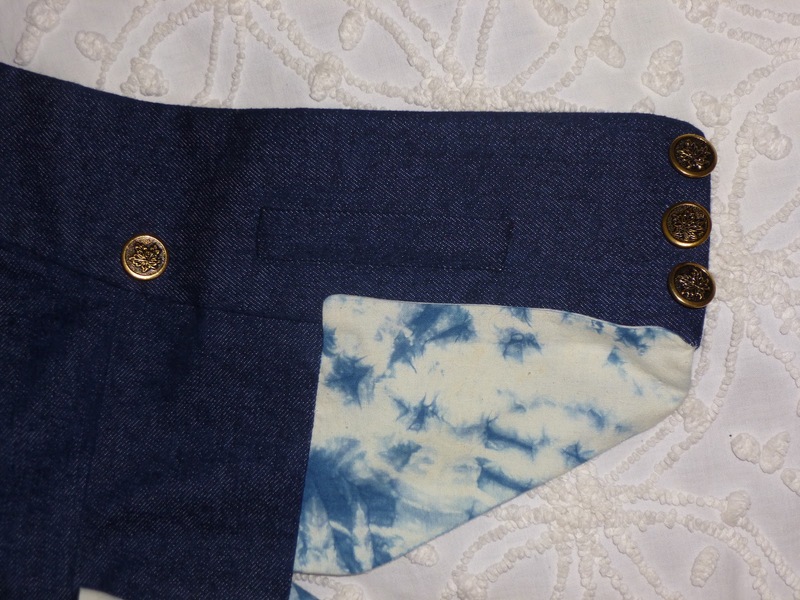 Draft a new breeches pattern that fits well. And do better with drafting in general. I'm often lazy when it comes to patterns, and have a bad habit of altering old patterns instead of drafting new ones. Ugggghhhh alterations. I hate doing them but I have a small list of alterations and repairs that need doing. They won't take long, I just need to DO them. Altering and re-making garments is a very commonly done thing throughout history and I should make efforts to not put it off so much. Sew with a plan rather than sewing lots of individual things that don't go together. A lot of the fabric I bought last year was chosen with coordinating colour schemes in mind, so this one shouldn't be too hard. Print out this list and put it on the wall by my sewing machine. I also intend to post about my road trip across Canada, and maybe possibly scan the rest of those very old photos I stated posting years ago and then didn't finish posting. Finding another job is of course a very high priority for this year too. Does anyone want to join me in my attempts to Not Buy Fabric in 2019? I know my stash isn't the only one that's out of control. You've been busy in 2018 and got lots accomplished. 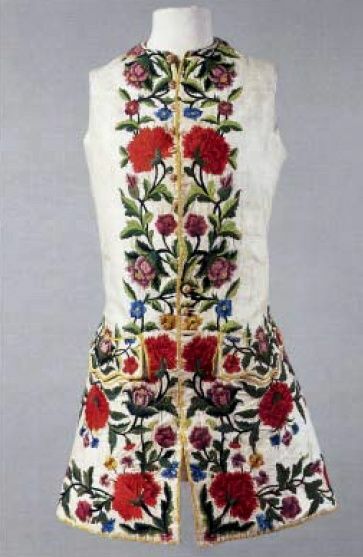 I love the embroidery. Your work is so precise. 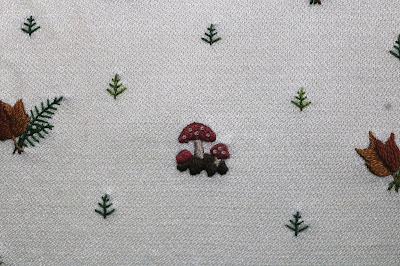 I used to embroider when I was a young girl years ago. I remember that pillow cases were usually embroidered. However, we used to iron a design on the cotton material and then embroider. I'm looking forward to seeing some pictures of your trip across Canada. Yes I think we have a few embroidered pillowcases, though I don't know who did them. Uncle Sandy also has one with the iron on transfer quite visible along the edge, but no embroidery on it! Congratulations. Job well done, for 2018. I'm so pleased I've joined your admirers. I found you on The Aubrey-Maturin fb page, and am so exited for your coming years posts. Much best wishes for your challenges this year. And an ironic 'good luck with that' for the 'not buying new fabric' this year. I have high hopes but can also think of times when it might be good to give in. Love your page, love your work, love these photos. Thank you, I hope I do well with not buying fabric! I suppose there might possibly be instances where it would be better not to pass fabric up, like that heavy ribbed silk I got secondhand last winter for a fraction of the original price. But I hope no such opportunities come up this year. I had never heard of Aubrey Maturin, but google informs me that it is a series of books set in the early 19th century, what thing of mine was posted on this page? Presumably one of my 1790's things since I've never done anything from the 1800's or 10's?